Can I first just say how humbled and truly encouraged I am by all of your sweet comments from yesterday's post? This blogging community is amazing and every time I think it can't get sweeter, it does! I can't wait to share part two, which you can expect tomorrow for those of you who are interested in reading. Now on to today's details! Blazers are one of my comfort zones - if you couldn't tell since I already showed a blazer look earlier this week... Oops. I don't know if it's the structure or the fact they can be dressed down or up? I seriously have a closet full though! And I am already thinking I need to add a few fun new colors for this Spring and Summer because they are so easy to throw on over a dress to church! 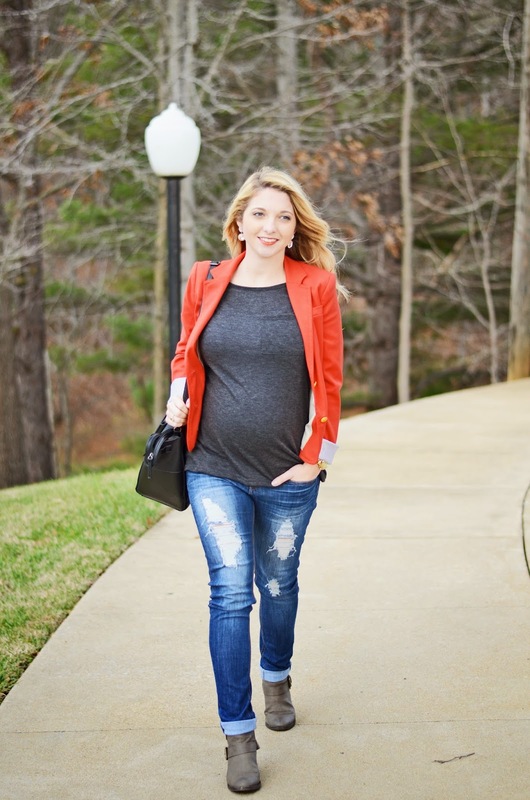 Also, I seriously can't get enough of these maternity jeans from Pink Blush! They are incredible and I love that no one would ever know they are maternity! I've styled this blazer before, which look is your favorite? 13 comments on "Style || Coral Crush"
I love that color and I never think to incorporate it into my wardrobe, thanks for the inspiration! And FYI - I love reading your blog and seeing pictures of your little baby bump growing. It puts a smile on my face! Love this look - I'm a huge fan of blazers, too. The coral adds a bright pop of fun to pretty much any outfit! Also, I just have to say - since I met you after you already were pregnant, it's fun to see photos of you without your baby belly. You are just the cutest! Oh my goodness, I have fallen in love with this blazer! It adds the perfect pop of color. I'm also really digging paring it with the stripped shirt. Super cute! I love the blazer with the jeans and boots! So adorable! Definitely my fashion inspo for when I'm pregnant! The best part of all your style posts is that you're going to have so many amazing baby bump pictures! 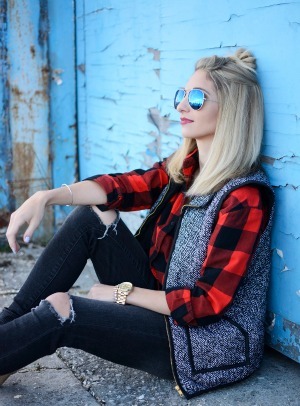 You could have totally worn this look for the linkup Tuesday, because now all I see when I look at your style is J.A.! Oh I love them all! You have some great style girl! :) Thank you for pouring out your heart to us yesterday! 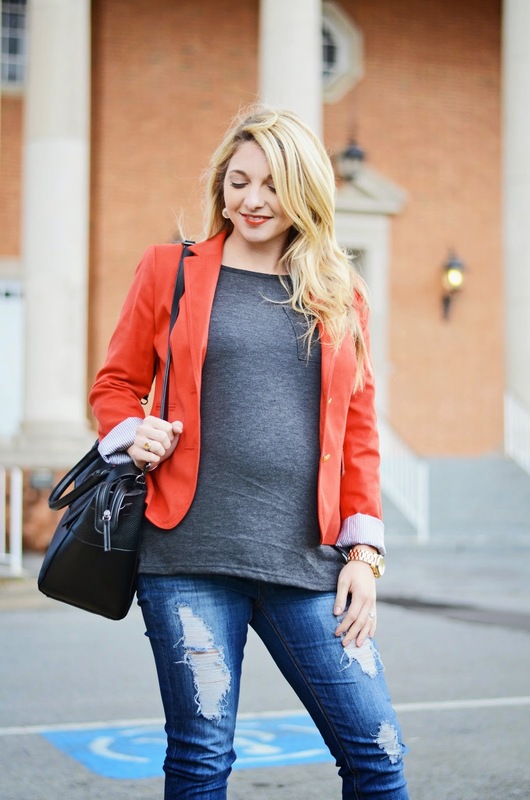 I"m loving the blazer with the jeans! Such a great pop of color, thanks for the inspiration, I am going to have to find a bit of coral for my own wardrobe!